To be sure I wasn’t picking a mutated colony for my master cell bank, I tasted all of the clones and counted the number of cells and determined their viability. Each clone had a similar cell count and viability. The final gravity of each was also within one or two points of each other. As far as taste, all three tasted slightly different. They did not differ drastically from each other, just some minor differences in esters. It was so minor that I imagine if I split each clone three ways, I would taste the same variations within the same clone. Now that I have my clone, I wanted to see how it performed in a beer. 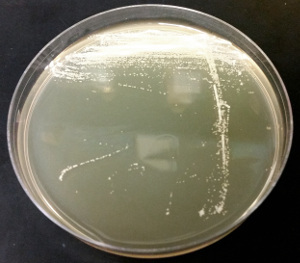 There are a couple studies that compared the fermentation of S. eubayanus with the lager yeast S. pastorianus. These were academic studies performed in the lab, and they provide some good data, but I really wanted to know how S. eubayanus tastes. I did find one other reference to brewing a beer with S. eubayanus, but that’s it. So I scaled up clone 1 for side-by-side comparison with WLP838 Southern German Lager yeast. I inoculated 3 L of 1.040 wort from a 5 mL culture of S. eubayanus. After stirring for a few days, the starter was finished, and the cell count was 140e6 cells/mL. That’s right around the average cell counts I see for most of my ale and lager strains. I brewed a German pilsner and split it equally between the two strains – 2.75 gallons each. I pitched equal amounts of yeast into each 3 gallon fermentor, and fermented at 50F. The WLP838 took off rather quickly, which I’ve seen before with this strain. The S. eubayanus lagged a day or two behind. By day 12, both beers were finished fermenting, and the yeast was mostly flocculated. I then moved them to room temperature for a couple days, tested for diacetyl (both were negative), and began lagering. After transferring the beers to secondary, I dropped the temperature 4F per day (2F in the morning, 2F in the evening), from 50F to 34F. Following 10 days at 34F, I primed each with 2.5 oz of dextrose and bottled. I kept other at room temperature for just over a week, then stored them at 34F to continue to lager. Enough of the methods, here are the data. The starting gravity for each was 1.054. The final gravity for the WLP838 was 1.011, which translates to 80% attenuation and 5.7% ABV. S. eubayanus attenuated only 63% to 1.020 (4.5% ABV). This is constant with what has been reported in the literature, and is correlates to its inability to ferment maltotriose. There was no difference in the appearance of the two beers. Both were brilliantly clear, and a Pale, straw yellow. The aroma for the WLP838 was typical of a German pils. The was some malty sweetness and a hint of hops, but overall very clean. S. eubayanus, on the other hand, had some notes of DMS, a very slight phenolic note, and perhaps acetaldehyde or an appley-ester aroma. Both beers were very similarly medium bodied, again surprising given the nine-point difference in the final gravity. The flavor of the WLP838 was typical of a German pils. It was very clean with a malty backbone, and a slight hint of hops. It was very balanced and easily drinkable. 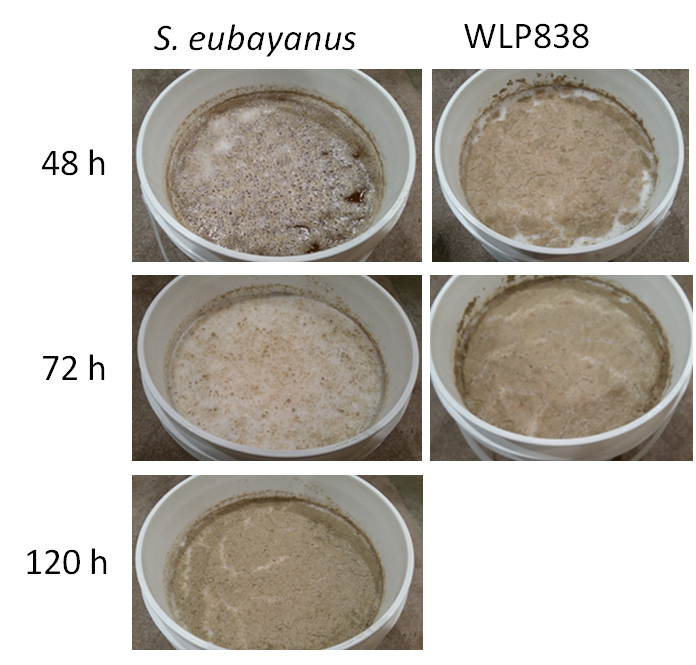 Despite the low attenuation, S. eubayanus did not taste sweet; WLP838 actually tasted a little sweeter. The S. eubayanus beer was very muddy. There was some DMS, slight apple-like esters (ethyl caprylate? ), and a fair amount of hop bitterness. Overall it was not a balanced beer. It was reminiscent of a mass produced light lager or cream ale. Although the beer was not as balanced as WLP838, it wasn’t not good, just not as good. With the right recipe, this strain may produce some excellent beer. It may be great for session beers. The low attenuation does not result in an overly sweet or heavy beer, and may provide the perfect balance for a light lager, a mild, or any other sessionable beer. It will be interesting to find out what influence different malts, temperatures, hops, fermentation times, etc. will have on the flavor and performance of S. eubayanus. Also, I lagered for a very short time, and I wonder what affect a longer time lagering will have. Will S. eubayanus clean up given more time? There is a lot yet to learn about the brewing potential of S. eubayanus. I will do my best to post updates to my brewing with this new species.